01. How many pounds of bananas do we order a day? 02. How many patio tables do we have outside? 03. How tall is Andrew Highsmith, the Chief Engineer? 04. What is Karina's, Gina and Nora's favorite place to vacation? 05.Where did Mark Jones, President of Dr. Phillips Hospital, attend college at and what is his degree in? 06.What is Sandra Franks, EVS Manager, favorite item in the cafe? 07.If you purchased the below items from the vending machines located next to the Perry Pavilion how much would you spend? 08. If you working the PM2 dish room position, what time do you take your lunch break? 09. What is Rene's dog breed and name? 10. What is the name of our new administrative assistant and what was her previous employer? 11. Lorne's favorite food is? 12. Name three beverages we offer on the Hospitality Cart, which is prepared daily for guests throughout the hospital? 13. Food & Nutrition offers what types of salads from our room service menu? Name them. 14. Karen's favorite food is? 15. Lydia has a jar of ___________ on her desk? 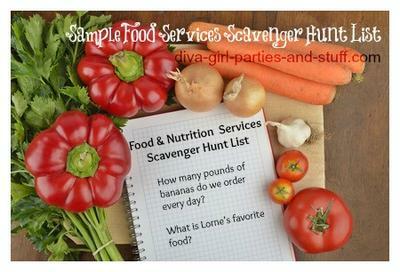 Use this scavenger hunt list as inspiration for your company or office scavenger hunts.